NASA-NOAA's Suomi NPP analyzed Hurricane Norman in the Central Pacific Ocean as it was rapidly intensifying into a major hurricane. 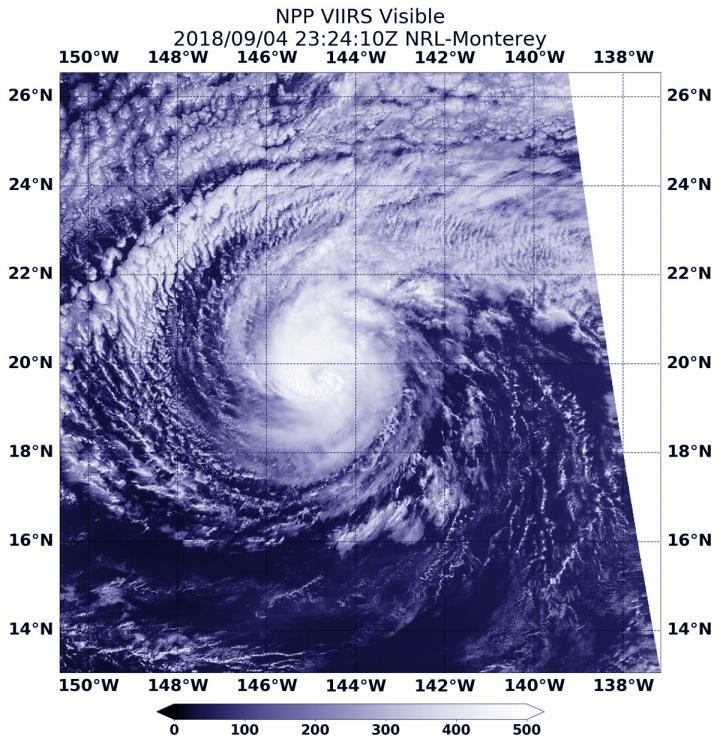 On Sept. 4 at 7:24 p.m. EDT (2324 UTC) the Visible Infrared Imaging Radiometer Suite (VIIRS) instrument aboard NASA-NOAA's Suomi NPP satellite captured a visible image of Hurricane Norman. The visible image revealed good formation with bands of thunderstorms spiraling into a cloud-filled eye. At the time, Norman was a Category 1 hurricane on the Saffir-Simpson hurricane wind scale with maximum sustained winds near 80 mph (70 knots/129.6 kph). The center of Hurricane Norman was located near latitude 19.5 degrees north and longitude 147.7 degrees west. That's 480 miles (775 km) east of Hilo, Hawaii. Norman is moving toward the west near 12 mph (19 kph), and this general motion is expected to continue through this morning. Norman is expected to slow its forward motion slightly, and turn toward the west-northwest later today and tonight. A turn toward the northwest is expected Thursday and Thursday night.